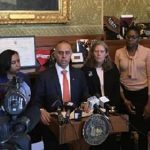 PROVIDENCE – Governor Gina Raimondo, Providence Mayor Jorge Elorza, elected officials, business, nonprofit and community leaders and Providence residents joined U.S. 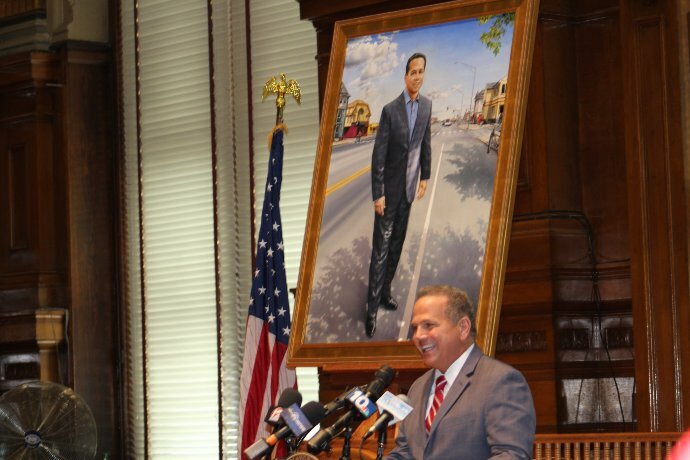 Congressman David Cicilline to unveil his official mayoral portrait on Sunday, April 14. 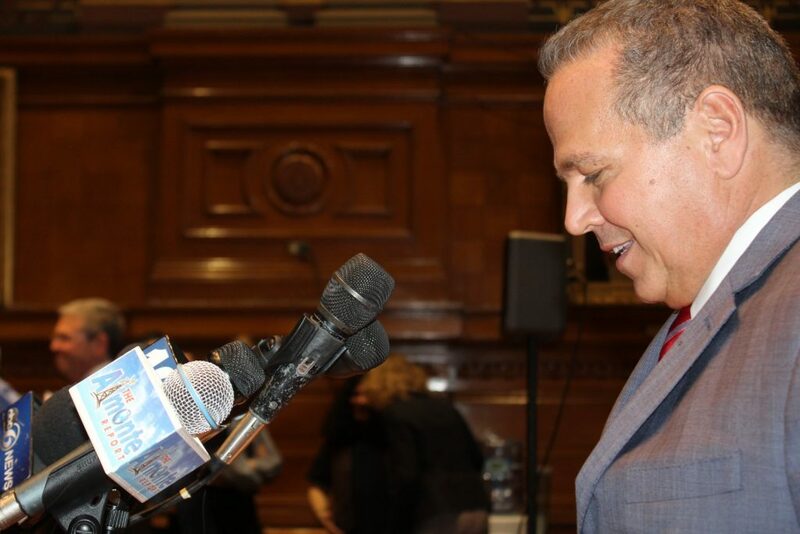 Cicilline, the 36th Mayor of Providence, ushered in a new era of city government, one that worked for the people, not just connected insiders. The mayoral portrait, completed by Agustín Patiño, is the first commissioned by a Latino artist and the first to depict the mayor outside of city hall. During his eight-year tenure, downtown Providence saw a resurgence of growth, including construction of the Westin Tower, the GTech Building and the Waterplace Towers. Equally important was the nearly $1 billion invested in the city’s neighborhoods, which led to new affordable housing, parks and green space; resurfaced roads and cleaner streets; and revitalization across the city’s neighborhoods through new development and main street investments. Cicilline reoriented city government to meet the needs of its people, starting with the reinvention of the City’s police department. Mayor Cicilline worked diligently to rebuild trust between residents and law enforcement, instituting community-based policing and data-driven crime prevention efforts that led to the lowest crime rate in three decades. Fiscal responsibility was paramount during his administration, which reduced management positions by double digits, fully funded the annual contribution to the pension system for the first time in years and ushered in top bond ratings from major agencies for the first time ever. And, committed to supporting families and youth, Cicilline built a network of high-quality after school programs and launched efforts to move families out of poverty and into the middle class. 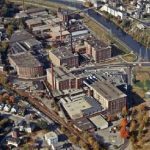 As mayor, David Cicilline sent the message to residents and businesses that Providence was a sound investment and the City was a reliable partner again. The Providence After School Alliance, a public-private partnership, has served over 15,000 youth in the city, established quality standards for the entire state and became a national field model. Mayor Cicilline appointed an ethics task force to draft a comprehensive ethics code for the city. The City professionalized the hiring process based on merit and instituted an honorable service precedent, stripping pensions from employees who violated the public trust. 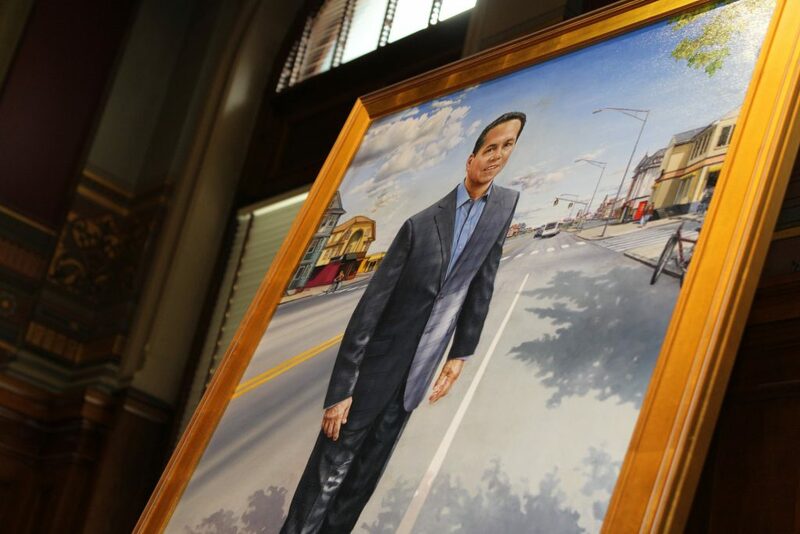 The new portrait depicts Mayor Cicilline as he would want to be remembered best: in the thriving neighborhoods of the city he loved and served. Artist Agustín Patiño is heavily influenced by his native Ecuador, having lived in the Amazon region, one of the most unique landscapes in the world. Patiño moved to the United States and relocated to Providence. His current public artwork includes a series called the Four Elements, which includes The Plaza of Art and Cultures and The Dialysis of the Planet located in South Providence and Museo del Aire / The Air Museum located at the Wheeler School on the Eastside of Providence. He works directly with the community through artist talks, panel discussion and workshops. Prior to his time as mayor, Cicilline served four terms as a state representative from Providence. He is a graduate of Brown University and Georgetown University Law Center. 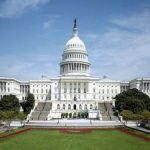 He is currently serving his 5th term in the U.S. House of Representatives. The portrait unveiling was organized by Michael P. Mello, Portrait Committee Co-Chair, Howard G. Sutton II, Portrait Committee Co-Chair, Myrth York, Portrait Committee Co-Chair, Christopher Bizzacco, Deborah Brayton, Gonzalo Cuervo, Amy Gabarra, John J. McConnell, Jr., and Karen Watts.